Introduction – experience Negombo’s best kept secret? Come with us to celebrate the natural beauty of Negombo Lagoon with Captain Fernando’s boat tours. Our friendly and qualified crew invite you on a unique cruising experienceon the smooth waters of one of Sri Lanka’s largest coastal lagoons. Escape the hustle and bustle of Negombo town as we take you on a tropical adventure in our little fishing boat that carries 8 passengers and crew. 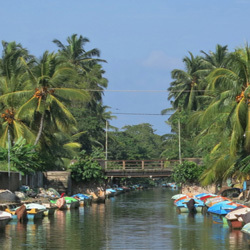 From our convenient dock on the historic Hamilton Canal we cruise a short distance through the heart of old Negombo town before entering the lagoon. You will get a close up view of local fishing life as we pass by the fish markets and thousands of fishing boats of all sizes – ranging from small lagoon canoes to large ocean trawlers. Your English speaking guide will share the stories of our traditional lifestyle and explain the natural environment as we drift along past a wilderness of coconut palms, mangrove forests, all sorts of birds and marine life. You will fall in love with the natural beauty of our lagoon and relax as you take in the spectacular views across calm and peaceful waters. The Fernando family has been fishing the lagoon for many generations. 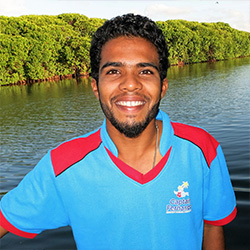 Your boat captain Romesh Fernando has grown up fishing with his father on the lagoon and welcomes visitors to have a taste of local life.